The Blackburn Local Saddle Bag Panniers are a single solution to dual-compartment storage. With a combined volume of 36 liters, Blackburn has maximized capacity in a lightweight and easy to use saddle-bag design. 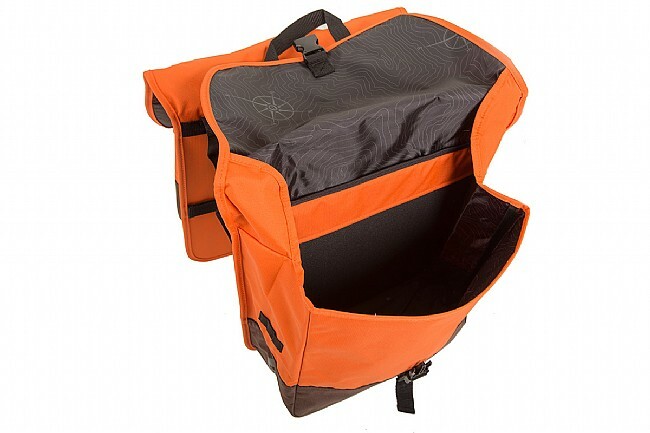 The panniers are constructed from 210D tough polyester with a water-resistant treatment and topo-print lining. Hand-holds and a shoulder strap provide plenty of options for off the bike carriage, and reflective print plus bike-light loops on either side enhance visibility on the road. Compatible with most standard rear racks as well as Blackburn's Interlock™ one-key security racks. Claimed weight is 1230 g.
Came quicker than expected. Price was reasonable. So far great product. 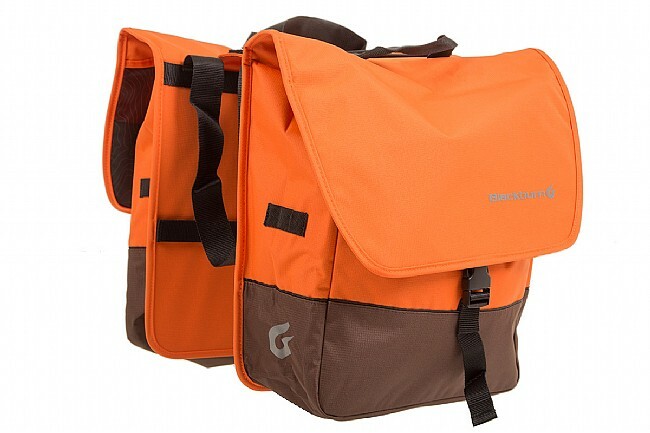 I use these panniers for hauling my work stuff, laptop, lunch, change of clothes, etc to and from work. Initially, I was disappointed that they would not stay put - the Velcro straps are not adequate for securing the panniers to the rack if anything is loaded into them. They kept sliding forward (so that my heels would bang into them on each pedal stroke) and pulling lopsided on the rack if the weight was not perfectly distributed. I mean, they really flopped all over the place and it was going to be a problem. I seriously considered returning them. However, I solved that issue with the clever placement of two bungee straps. Now, it is stable and stays positioned as far back as possible so as not to cause my heels to hit them. I even carried a dozen fresh eggs home with all the aforementioned gear. This ended up being a good deal. I purchased these on closeout thinking that they were two bags that could be separately attached. They cannot. Plus, the attachment method is nothing other than a small-ish Velcro strap. Not a great way to quicklyeasily secure and remove the bags for manual transport. My ultimate reason for selling this to a friend, is that there are no small pockets to stash little items. This mean's they're closer to a soft basket than a pannier. I needed somewhere to quickly and securely stow little items that I would want to loosely roll about in the only large main compartment. Bottom line I wouldn't recommend these unless you're looking for a set of simple and sturdy bags to stash your helmet and other larger items in. Otherwise, you'll be left with stuffing other smaller bags into it. Not was I was looking for. Decent panniers for the price. Commuting. Easy loading and unloading , secure to the rack, wish the lower fastener had additional hooks to mate with rack down at the dropouts.